Look at a football field. It looks like a big movie screen. This is theatre. Any writer worth his salt will tell you that the greatest dramatic literary arches rely not in the accurate telling of the protagonist’s highest highs, but instead in the grandest portrayal of the story’s lowest lows… and how he manages to fight his way out of life’s dark valleys. Like any great movie or best-selling book can attest, it’s not where you start but where you end that matters most. Which brings us to Tony Veland. The Benson Bunny’s diary will make you cry from triumphal joy as well as tragic heartbreak. A quiet leader, not even the most creative of literary types could have dreamed up the path Tony traveled, because ‘The next Turner Gill’ had no way of knowing what was to befall him. Let’s hear of his beautiful, painful, promising tale and the lessons he learned…with a little encouragement from a special Husker fan along the way. Question: So what year was your first fall camp, Tony? Any first memories, impressions? Q: Who was the first friend you made? TV: It was probably Popplewell. Brett Popplewell was the first friend I made. We were roommates and just kind of connected. He was a receiver and I was a quarterback. And I hadn’t ever met anybody from Australia and his accent was funny, and we connected and we’ve been friends ever since. Same old Brett. Q: Anything stand out from your first practice experience? TV: I was a quarterback and I think I was still a little, so overwhelmed, ‘Here I am at Nebraska playing quarterback here.’ I was glad I wasn’t on defense at that time, (laughs) and I remember Kevin Steele and Charlie McBride letting a couple of guys have it. I remember we were just starting practice and I was happy I wasn’t on that side of the ball, they were pretty animated. And then I saw Coach Solich go crazy, too, a couple of days later. He’d get on people, too. It was definitely interesting. And you could also feel the energy from Coach Brown with how animated he was, it was just so surreal being in that situation. It was a dream of mine to be playing football at the University of Nebraska. And I didn’t know if I’d actually play collegiate football or where at, but to be there at Nebraska and actually know that I was on the field at the time was pretty big. Q: You grew up a Cornhusker fan? TV: Well, I did, but I was kind of a closet Nebraska fan, (laughs) the reason being was my dad was a huge Oklahoma fan. A huge Oklahoma fan. So I hardly ever watched a lot of Nebraska football when I grew up. And when Oklahoma would play Nebraska I was always secretly cheering them on. (laughs) It was a little crazy and a little conflicted, because I hated to go against my dad at that point, but I think that was where I started the whole Nebraska kick. I remember watching Switzer and Osborne back in the day, you know, Steve Taylor and Turner Gill, and I knew that’s where I wanted to be. It was all messed up. Q: So was it a little intimidating at first? I mean, here you are working with “The Man,” Coach Osborne? TV: You know, I think I was just kind of in awe, originally, because we all knew what he’d accomplished at the University. And for him to be spending as much time as he was with the quarterbacks? Because even before I really got a chance to know him I knew he was about more than football. He had that presence about him. It’s kind of hard to explain, but some people, after they’ve accomplished so much and have so much respect from other people, you just kind of felt it. Q: Did Coach Osborne visit you at your home during the recruiting process? TV: He actually did. I remember we had a basketball game one night, and I remember him coming into the gym (because it was all kind of hushed) (laughs) and I definitely tried to pick up my play a little bit. And by the time I got home he was there. And he was, “Hey Tony, how are you doing? You know, we’re interested in you playing.” And I have to tell you, the thing that stood out to me: I didn’t realize how tall he was. So here is this skinny giant, you know, (laughs) standing in your doorway. It’s kind of intimidating, but at that time it was pretty validating to me, because in high school football we hadn’t won very many games. I knew I was an okay athlete, but I didn’t have crazy stats. But for him to be there interested in me, I was pretty flattered. Q: What did your Dad think of that whole thing? TV: Well, unfortunately he didn’t get a chance to take part in that. My dad passed when I was a junior in high school and he didn’t get to see that. But my Mom thought it was great because her baby was going to college, and I was going to be the first one in the family to do that and we knew it was big-time football. So I knew I was getting ready to do something and I was pretty happy about it. Q: Your father’s passing at that early age… did that affect you as a player down the road? TV: I think so. It taught me that in life some things happen that you don’t expect to happen, and even though they may hurt or it may feel better to just shut down and sit there and grieve and let life go on, you don’t do that. It’s a situation of ‘life goes on’ regardless of what happens. That started me on the whole kind of me just focusing on accomplishing my goals regardless of what happened, to keep my mother happy and proud of me, especially since she was really taking care of us and making sure she could do all she could to make us successful. So I did all I could to make sure I was doing everything to be successful. Q: You were the oldest? TV: I was the oldest child. I had a brother 4 years younger than me and a little sister about 7 years younger than me. TV: Yeah, a little bit. Just a little bit. (laughs) It was really interesting, because they wanted me to play defensive back when I first got there. They recruited me as an athlete but they really wanted me to play defensive back, and I was really determined to prove myself as a quarterback. I thought with their style of football that I had the running thing down as an option quarterback and I had to learn the passing and the defenses and this and that a little more, gain a little more confidence in myself to have a chance. But I think more than anything it was my inner me saying, ‘They are saying you can’t do this. Go prove them wrong.’ So I think I took that whole attitude to learn as much as I can and make sure I do a good job. And it was difficult because I wasn’t the highly touted quarterback prospect: it was Clester Johnson at that time. And we had battled back and forth in high school, and here’s this guy who’s coming out of high school highly touted, all these stats, he can throw the ball, he can bench 400 lbs., it was just a little intimidating. 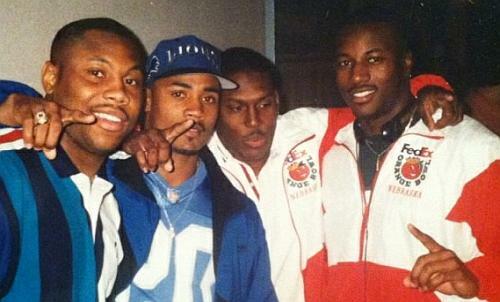 Not to mention you had the guys already there: the Keithen McCants, the Mike Grants, Mickey Joseph and all those guys. I just knew that I had to get in there and try to take the initiative and make sure that I was going to put myself in the best situation. I tried to become a student of the game and keep Osborne and Gill happy. Q: Did your doing so make you a better defender in the end? Q: When did you make the switch over to defense? TV: That was actually in ’93. It had been two years and some things had transpired. The first year I redshirt and I learned everything that I could, and the second year I had a chance to actually compete and when I went into fall camp me and Mike Grant were kind of neck and neck, so there was a legitimate chance that I was going to be getting some playing time. And what ended up happening was the last play of the last scrimmage before our first game I end up breaking my collarbone. So when I broke my collarbone, then obviously Mike Grant was the starting guy. And then we had some guy named Tommie Frazier who, halfway through the season, took over there, and history was written after that. But I came back that year and I was determined to play quarterback and not let the injury stop me. And I still had a lot of other things going on, like a pulled hamstring, rolled ankle, still a lot of minor stuff, and then I still came back. Then that next year Tommie was looking good, and Brook and me were battling for number two. It was the second or third game of the season and I was running the option, and I went to plant & run and somebody grabbed me and my knee twisted a certain way and it tore my patellar tendon. And once I tore that I went through some changes, and I felt I did everything I could to be successful on the football field but it seemed things kept stopping me, and I didn’t really understand why. Because at the time I was a young kid and I felt I was doing everything right: I didn’t get in trouble, I was doing pretty well in school, trying to be an example for some of the younger players out there. And here it was: every time I turned around it seemed some type of injury was stopping me from accomplishing what I wanted to do. And I kind of went into a little bit of a funk there and got down on myself and had a little pity party for myself for a few months. But then I spoke with someone who was from out of town… I didn’t even know this lady and she wrote me a letter. She was just encouraging me and giving me words of comfort, and for some reason the words she said really touched me and opened my eyes as to what was going on. Her name was Diane Yeutter. She was teaching in Lexington, Nebraska, and we’ve been friends ever since. 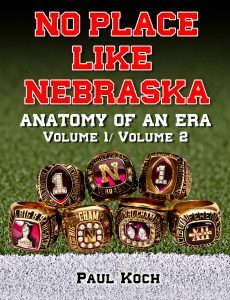 It was crazy, but she actually used to write Nebraska football players when they were going through things: she’d been writing for two or three years, every week, and she’d write just to encourage them. And she told me that there were times where she, herself, would become discouraged and thought of not writing…. and she told me that I was the first person to respond back to her. So it really filled her day and made her feel pretty good with what she was doing, because I know she was reaching a lot of people even though they weren’t getting back to her. At that time I figured I was still gonna come back from that knee injury, but I figured, ‘Maybe I’ll stop getting hurt if I start hitting people,’ so I started to try the whole defensive back thing and that’s what happened from that point on. It was not an easy switch by any means, because you have to have a certain attitude to play defense. I was used to avoiding people, and now I had to try to run through them… and you have to have this mean disposition. You have to have a little bit of attitude to play defense, and I was really one of those laid back, quiet people. TV: Yeah, (laughs) very laid back and quiet. And even when I played I was laid back and quieter, but on the field -when I had to get excited?- I did. It was not an easy switch but, at the same time, knowing the quarterback position and knowing the defenses we were running made it a little bit easier. And in high school I played cornerback and safety so I was pretty familiar with it, but it was just getting back to learning the footwork and the constant reps that were going to make me a better player. I made the switch and it worked out.